We recently returned from a trip to visit Naoko’s parents in Tokyo. We took lots of pictures. Here are some of them. 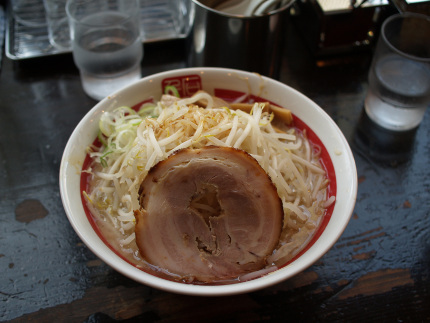 A nice bowl of ramen with creamy broth, crunchy bean sprouts and delicious soft pork. I love ramen. A wedding at Meiji Shrine. We went to the shrine during Shichi-Go-San, so there were lots of little girls and a couple of little boys all dressed up in kimono. Our daughter, having just turned three, was one of them. 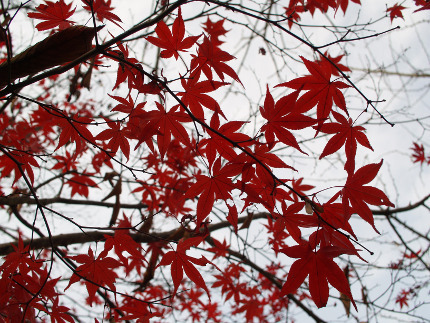 Of course, it is the season of beautiful autumn leaves. It is actually quite hard to capture the beauty of these maples. 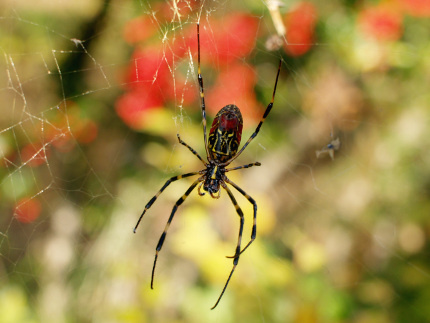 This picture of a female Nephila clavata spider was taken near Chichibu. This one measured about 6 or 7 cm diameter (including legs). One of the locals told us that they let the spiders fight each other for entertainment. Of the locals, that is. 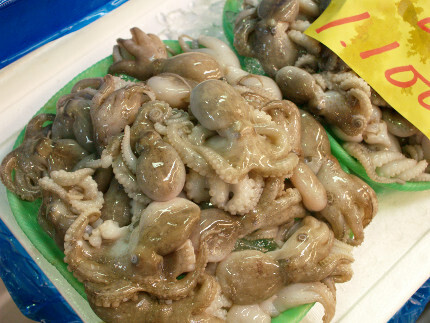 A pile of small raw octopus at the famous Tsukiji fish market, which I finally managed to visit. It’s a new year! Time for more resolutions. I can’t believe that’s actually two years ago. Yes, my blog has been neglected, but not for want of anything to write about. Oh, there are so many things I have an opinion about. But always, it’s the question, is my opinion interesting, new, well informed, etc? And can I write something sizable about it? Not conductive to writing every monday (recently replaced by sunday, but I bet you hadn’t guessed). Maybe I should try less hard to be reasonable. Oh yeah, e-mail is getting better, mainly thanks to the Inbox Zero articles. Size is the Enemy, leading to the issue of abstractions in programming languages. 80/20, or the problem of getting your average Java/.NET programmer to really learn and use new things (e.g., new methods of abstraction). Lots of new languages are popping up, all running on some VM or other (e.g., Scala, Nemerle, Boo). Where’s the development in regular compiled languages? This surely points in some direction, but some weighted average will have to be taken to find out what that direction is. I did manage to quit the job that was definitely going in the wrong direction, so there’s a plus. Zurich has the best zoo in Europe. Ba ba baa ba baa, ba ba baa ba baa. (The bas are short, the baas are long). The piece was performed at a constant pitch. I’m still working on the correct rhythmic notation; it’s pretty complex. Years from now, we will say: We were there at her first performance. For work, I’m in Chennai in India. Up to today, I have seen the apartment where we are staying, the office, restaurants, and the streets in between. That is actually already a lot to see: There’s always a lot going on on the streets. For tomorrow, a trip was planned to Mahabalipuram, but now there’s a big strike planned, and the trip was canceled. The reason is not that there won’t be transport, but that people will be allowed to throw stones at cars without fear of punishment. Last night, I had a dream. There was a gathering of people for dinner. It was probably not my house. I mean, it didn’t look like my actual house, but in my dream it was also not my house. We sat at a table with a thick rough wooden top. The light was soft, coming mostly from the simple lamp hanging over the table. The floor was also wooden, as were the low shelves lining the walls at the other side of the room. I was sitting at the head of the table. I’m not that tall, so I was looking slightly up at the other people at the table. On the second chair to my left sat a young man who was somehow connected to Microsoft. Probably he worked there. He was very enthousiastic about Vista. At some point he said something that really upset me. I think it was about how something could not be fixed, and users just had to either live with it, or buy something new. I told him, how can he say that when there are people how have to get by on very little money, and can’t afford to buy the shiney new stuff, and that Bill Gates is really out of touch with reality. I don’t remember the exact words, but I was clearly very angry. The young man decided this animosity was too much for him, and left. Afterwards, I was standing on the other side of the room, shaking so badly that I dropped two glasses that I was trying to drink from to calm down on the floor. As of today, the ‘Woordenboek der Nederlandsche Taal’ (Dictionary of the Dutch Language) or WNT is online. It is a massive dictionary of Dutch, apparently comparable to the Oxford English Dictionary. I first heard about this dictionary when I was a young boy, and my father made a documentary about it (sorry, those links are in Dutch). At the time, the WNT was not finished and already occupied several bookshelves. People had been working on it for 125 years, and it seemed it would not ever be finished. Since then, they’ve clearly come a long way. By the way, I was alerted to this historical event by the invaluable Language Log. Be sure to also read the resulting discussions of Babel Fish name mangling. On November 2nd our daughter Sophia Emiko was born. At birth, she weighed 3050 grams, and was about 48 cm tall. In the photograph, she is about three and a half hours old.